Mac OS X Unwired introduces you to the basics of wireless computing, from the reasons why you'd want to go wireless in the first place, to setting up your wireless network or accessing your wireless services on the road. The book provides a complete introduction to all the wireless technologies supported by Mac OS X, including Wi-Fi (802.11b and g), infrared, Bluetooth, CDMA2000, and GPRS. You'll learn how to set up your first wireless network and how use the Mac OS X software that supports wireless, such as iSync, iChat, and Rendezvous. You'll also get a good understanding of the limitations and liabilities of each wireless technology. 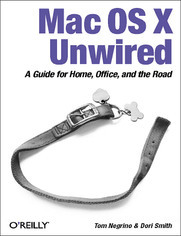 Mac OS X Unwired is a one-stop wireless information source for technically savvy Mac users. If you're considering wireless as an alternative to cable and DSL, or using wireless to network computers in your home or office, this book will show you the full-spectrum view of wireless capabilities of Mac OS X, and how to get the most out of them. Are 802.11 Networks Really Secure?